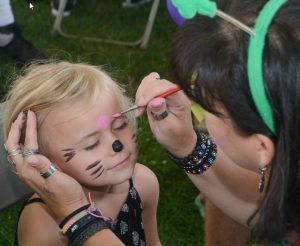 Peoria Irish Fest is a family-friendly event! Under our tents you will find free activities for kids of all ages. Crafting – Many fun things to make, including shamrock scratchers, foam hats, beading, and coloring. All items can be taken home as a souvenir of their time spent at Irish Fest! Face painting and temporary tattoos. Fingernail painting with green nail polish. Bouncers (Fun on the Run) – weight limit of 100 lbs (for safety). Get face to face with farm animals with a petting zoo from Barnyard Discoveries. Visit with a few animals and enjoy a Q&A with the keeper from Peoria Zoo Mobile. Story and tea party with a fairy (twice daily – see onsite program for times). Kid-safe demonstrations by the Bradley Chemistry Club (Saturday afternoon only). Note: Parents must supervise children at all times. Thank you for helping us create a SAFE environment for your Leprechauns!